I’ve been working on LoRa systems and really wanted to find a ‘best of breed’ antenna to use. 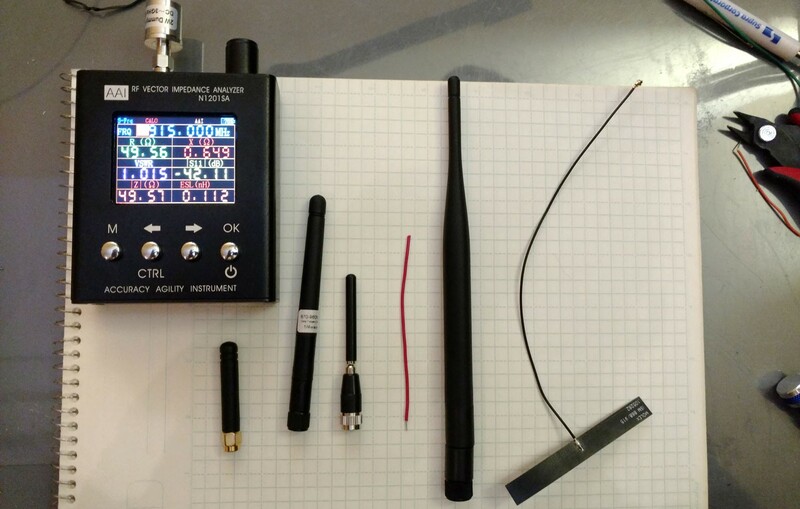 So, I found an inexpensive but accurate antenna tester and rounded up a bunch of antennas. It’s tricky to test antennas because they are so sensitive to nearby metallic objects and ground planes. Here, for example is a plot of two signals and a picture showing the two transmitters. To explain: in this case I was measuring the two transmitters shown above. 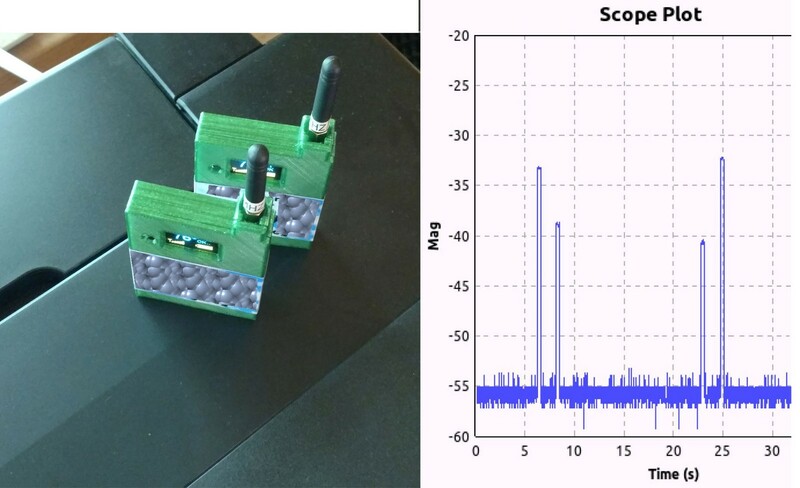 The receiver (a LimeSDR Mini) is located a distance away and perpendicular to the line — so you’d expect the two to generate identical signal strength but they don’t. To confirm it was positioning I swapped the two units and so you see (on the left) the second pair of traces and (on the right) the first pair of traces. What a difference it makes which is in front! This started as Testing Antennas using the LimeSDR Mini, but what I found was that, at least for now, I’m unable to get consistent results from it — and it’s very slow. So, instead I’ve switched to an N1201SA. 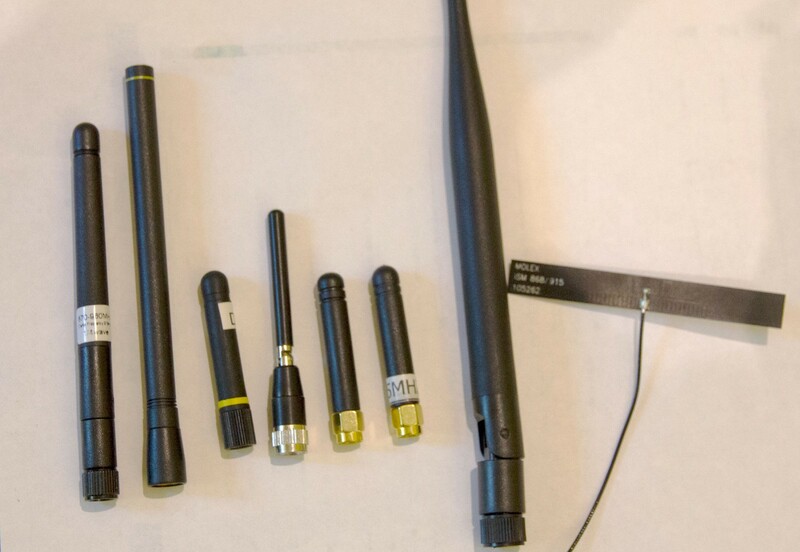 Over time, if I get more antennas, I’ll update this article to include them. Here’s an image of my final set of antennas. I have more than 1 of a number of these and confirmed uniformity (or not). Two of them are specifically purchased from Digikey and have spec sheets so I have a high confidence they adhere to spec and they provide controls for the testing. Folding whip antenna for 868–915 RFID. This came from Microcontrollershop. Dipole whip antenna. This came via Digikey and is a Linx ANT-916-CW-HW. It’s a very narrow band dipole at 915MHz. Quarter-wave short whip antenna. This came via Digikey and is a Linx Ant-916-cw-rh. This is specified to require a ground plane. Skinny foldable antenna. I have decided that this is a Linx LTE Monopole Antenna. Interestingly, the spec shows a very strange co-linear ground plane and that may explain why I got such good results in the signal strength testing where I’m using a device with a circuit board acting like a co-linear ground plane. Tri-band short stub: I have a bunch of these, not necessarily all the same (but they all look the same). The ones I purchased deliberately are here. They are advertised as including GSM on 868/900/915 (?). 915MHz short stub. This is advertised as specifically 915MHz even though it looks just like the above tri-band stub. Purchased here. Tall (dipole?) antenna rated at 915MHz. This was purchased here. Molex internal ISM (868/9156MHz) antenna 105262. This is U.Fl and not testable using my SMA setup for now. To test the antennas, I measured impedance and SWR at 902, 915, and 928. The actual ISM band range is 902–928 and my devices wander around the band so I tested the entire band. I first calibrated the AAI unit with a short, load, and open. I’m not sure how effective that was. Most important is that my short extension cable resonated at about 700MHz and hence it had little effect. I had started off with a 1 meter cable (which resonates at 100MHz and harmonics) and it made the measurements virtually useless. The AAI unit does a good job using the internal calibration with the short connection but the case is a partial ground plane and pollutes the measurements, so I used an extension cable to remove the antenna from the enclosure. This worked very well. I did a set of tests with no ground plane and a set with a ‘full’ ground plane made up of a piece of aluminum foil. Here’s an image of the first group of VSWR curves. Each antenna has a left curve (no ground plane) and right curve (ground plane). The vertical axis lines are at 50MHz intervals starting at 800MHz and ending at 1150MHz. The marker is at 916MHz. The AAI has no way to transfer data so I used photos :). Click the photo to zoom in. With no ground plane this had a minimum VSWR of 1.7 at 980MHz, increasing to 4.0 at 916MHz. With a ground plane this had a minimum SWR of 1.4 at 830MHz rising to 2.3 at 916Mhz. Measurements were taken extended. The retail dipole was my best control. Measurements virtually matched specifications and by nature dipoles are resistant to ground plane effects. The dipole had a minimum VSWR of 1.1 at about 925MHz increasing to 1.3 at 916MHz. This is a gorgeous response curve. I’m fairly sure the flattening at high frequencies is calibration error. With a ground plane the dipole response changes marginally. The retail quarter wave whip also matched the spec incredibly well — a testament to the test equipment. With no ground plane it had a minimum VSWR of 1.7 at 970Mhz increasing to 5.0 at 916MHz. With a ground plane it had a minimum VSWR of 1.4 at 890MHz rising to 1.8 at 916MHz. With no ground plane it had a minimum VSWR of 1.6 at 960MHz increasing to 2.6 at 916MHz. With a ground plane it measured a very flat response with a minimum of 1.5 at 830MHz rising to 2.7 at 916MHz. The tri-band stub antenna had a minimum VSWR of 1.3 at 950Mhz rising to 2.1 at 916MHz. With a ground plane it had a minimum VSWR of 1.1 at 916MHz ! If you have a ground plane this antenna rocks. One of the four antennas had a different response so I plotted that as well. This antenna had a minimum VSWR of 1.2 at 925Mhz with no ground plane. With a ground plane it had a minimum VSWR of 2.4 at 850MHz rising to 3.3 at 916MHz. The other sample had a minimum VSWR of 1.2 at 970MHz rising to 4.8 at 916MHz. With a ground plane it had a minimum VSWR of 2.0 at 900Mhz rising to 2.1 at 916MHz. This antenna never worked right. With and without a ground plane the usable frequency range was off my chart. With a ground plane the short tri-band stub had a really good impedance plot. Most of the others were very good with a ground plane. The commercial dipole excelled when there was no ground plane, as did 3 out of 4 of the 915MHz stubs. For the first test, I’ve set up two transceivers using LoRa protocol. One is based on the InAir9B module while the other I’m going to swap modules around. They were placed on tripods about 20 feet from each other and then, on the second unit, I swapped out antennas while watching the RSSI (signal strength) values. Crude but useful. There’s no reason to test the garbage antennas, so I’m just looking at the three best-of-breed (note this is before I purchased the two retail antennas and the 915MHz specific antennas). Not surprisingly, the antennas perform almost identically. I’m not at all sure why the RFM95 seems 3dB better than the InAir9B. Either it matches the antenna better, transfers power better, or I’ve simply not done the placement of the transceivers well. 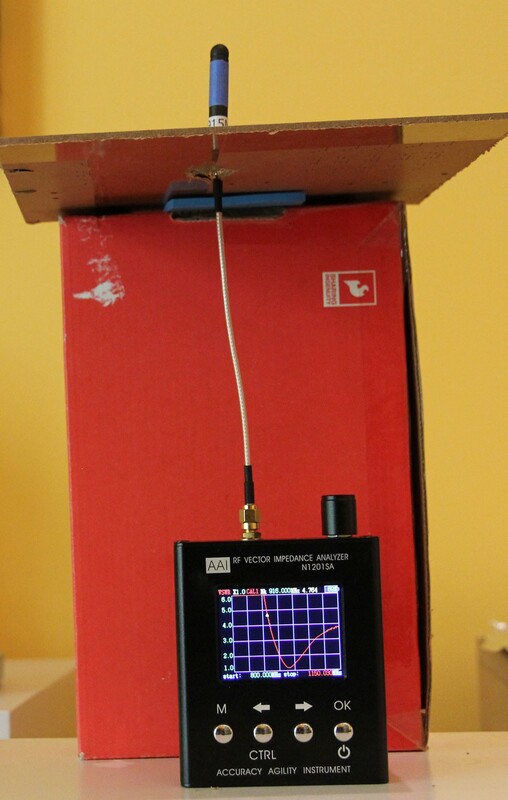 For this test I used the LimeSDR Mini as a receiver and put it into a different room, about 40 feet away, at about the same height as the transmitter. 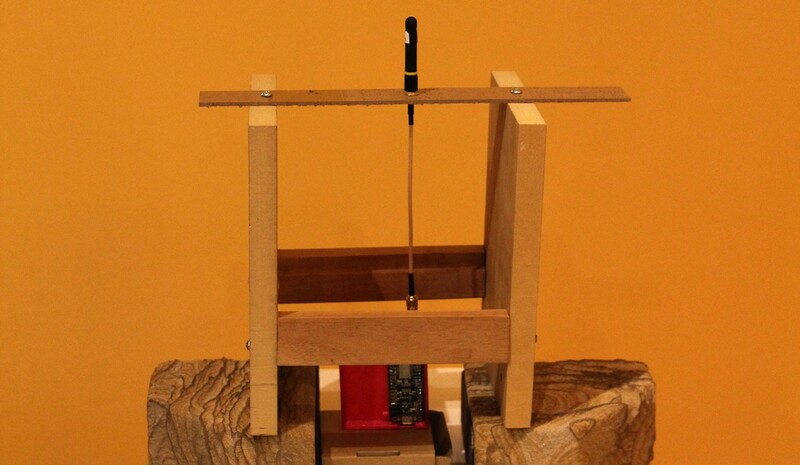 The transmitter was put into a more rigid jig so that the antenna could be swapped without anything else moving. Measurements are still somewhat sketchy. Even standing up 10 feet away while taking measurements affected results. Not surprisingly the dipole whip is way best with no ground plane. With a ground plane things tighten up considerably and the monopole and folding whip excel. The folding whip is long and almost certainly has a radiating pattern more horizontal so it has more gain. The monopole continues to surprise me. Caution: differences of 1–3dB in the chart above are well within measurement error. I’ve been trying to also test U.Fl antennas and finally found an SMA-U.Fl adapter that seems to work well. So, this adds two more antennas to the mix. This is a flat, flexible antenna measuring about 3"x.5". It measured very well when stuck flat to a piece of plastic with no ground plane (as designed). The gain is reasonable and dispersion pattern moderately uniform and it doesn’t use a ground plane (it’s a dipole). I have a wire that is very similar to an Anaren 66089–0906. I made it by taking a U.Fl to SMA cable and cutting it in half then carefully stripping the coax braid from the outside of the coax — producing a 3.2" insulated wire with a U.Fl connector. Molex (left) and Wire (right) VSWR charts. Marker at 915MHz. As you can see, both antennas work quite while from the standpoint of reflection. Since the Molex doesn’t need a ground plane it gets very close to a 1.0 VSWR at both ISM center frequencies but it is sensitive to being placed very flat and on a thin piece of material. The wire antenna is just that — a straight-wire quarter wave vertical antenna that works exactly as expected. It would be a great choice but it’s rather long compared to the stubby whips I’ve been using.